Let's start be saying I am not a morning person and also one of those, who is always feeling tired. However I'm not, neither do I want to get addicted to coffee, so I try not to drink it very often. But, there was a time, where I thought maybe coffee would be the only option for not feeling sleepy during the day. As I don't want to become a coffeeholic, I needed to find other alternatives to get energized in the mornings and I have just started with the "smoothies and tea" mornings, but I can already see that they are helping a lot. 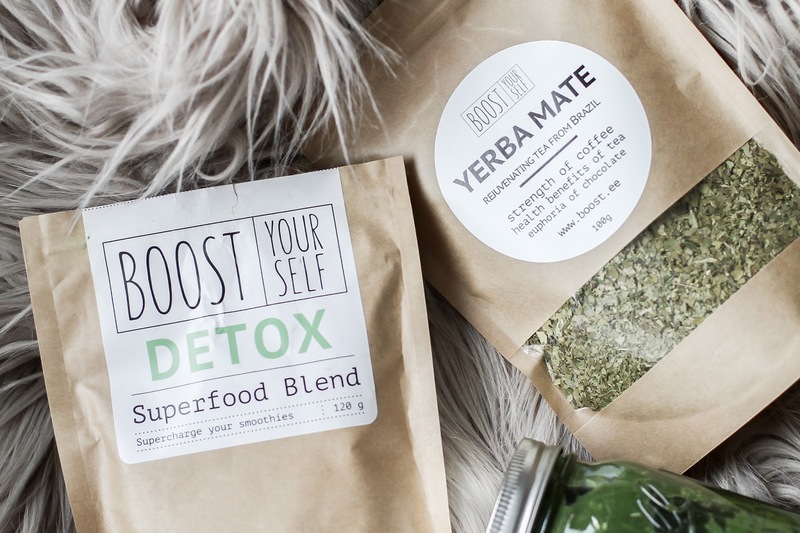 To clean my system first, I opted for the detox blend, but they have a variation of them on their site, depending on what you want to achieve. 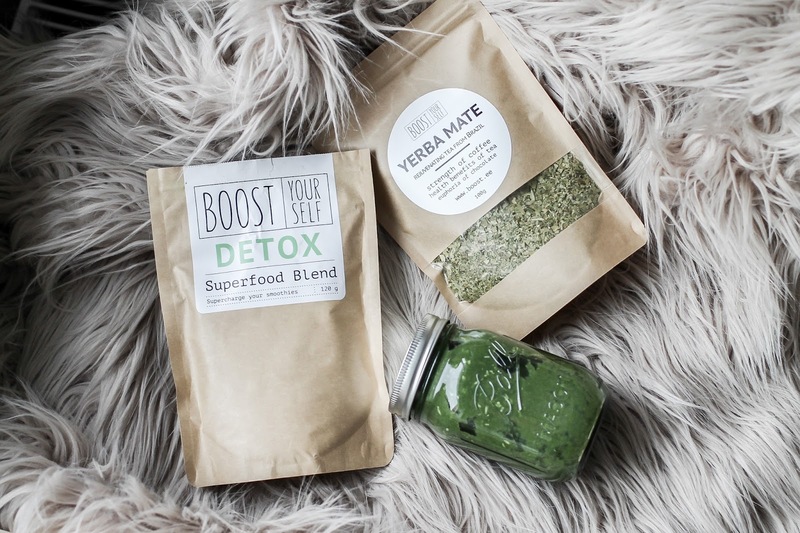 I now try to drink a green smoothie (with the detox blend) and 1-2 cups of Yerba Mate tea every morning-afternoon and I can finally go at least till 5 o'clock without always feeling like taking a nap. It doesn't sound a lot, but keep in mind, 5 days out of 7, I start my day around 6-7 in the morning.. and again, I AM NOT a morning person. I am just starting to get used to the new job and work schedule, so I don't want to take on too much, therefore for now, I'm sticking with just the smoothie and tea. However I really want to start working out again as well, so as soon as they open the Myfitness next to my office, I am there! Pinky promise! Have you tried any of the Boost products? Alustagem sellega, et ma ei ole kunagi olnud hommiku inimene, vaid üks neist, kes naudib kaua magamist ja tunneb päeva jooksul pidevalt väsimust. Senini olen aga suutnud kohvist, kui igapäevasest turgutusest, õnneks eemale hoida (kuigi vahel tundus, et ehk on see tõesti ainus abivahend). Joon seda küll vahetevahel, ent plaani sellest sõltuvusse jääda mul kindlasti pole. Niisiis olengi otsinud kohvile alternatiive. Nagu olen varasemalt maininud, tahan veidi tervislikumalt elada, aga olen alles hiljuti hakanud harjuma uue töö ja töögraafikuga, seega ei taha liiga palju uut enda õlule panna. Nii jäängi veel mõneks ajaks ainult smuutide ja tee juurde, ent niipea kui kontori kõrval Myfitness avatakse, olen seal kohal. Pinky promise! Milliseid Boost tooteid olete te proovinud ja kuidas rahule jäite?